Fidelma Cook, Lucy Crossley, Tom Kelly, and Claire Duffin, “Hebdo killers in ISIS martyrdom video – as French police discover his massive arms cache and link him to another shooting two days earlier,” Daily Mail (London), January 11, 2015, http://www.dailymail.co.uk/news/article-2905302/Calm-stare-Jewish-deli-terrorist-Jihadist-s-ISIS-suicide-video-emerges-confirms-link-Charlie-Hebdo-killers-calls-fellow-vigorous-Muslims-defend-prophet-Mohammed.html. On January 8, Coulibaly shot and killed a French police officer in southern Paris,“French police officer killed in shooting on edge of Paris,” Fox News, January 8, 2015, http://www.foxnews.com/world/2015/01/08/at-least-1-police-officer-wounded-in-paris-shooting.html. and on January 9, Coulibaly stormed the Hyper Cacher supermarket in eastern Paris.Lewis Smith, “Paris supermarket hostage reveals killer Amedy Coulibaly told him: ‘It’s nothing personal,’” Independent (London), July 8, 2015, http://www.independent.co.uk/news/world/europe/paris-supermarket-hostage-reveals-killer-amedy-coulibaly-told-him-its-nothing-personal-10376266.html. Coulibaly was killed in a shootout with police on the evening of January 9.“Paris Hostage Raid Video: Watch the Moment Police Storm Paris Supermarket,” ABC News, January 9, 2015, https://www.youtube.com/watch?v=SVS-a89laMc; Ricky Ben-David, “4 dead as French forces storm kosher supermarket,kill gunman; Charlie Hebdo terrorist brothers also killed,” Times of Israel, January 10, 2015, http://www.timesofisrael.com/terror-onslaught-in-paris/. Angus Berwick, “Spanish police arrest man suspected of arming Paris supermarket gunman,” Reuters, April 13, 2016, http://af.reuters.com/article/worldNews/idAFKCN0XA1JA?pageNumber=1&virtualBrandChannel=0. Coulibaly took 16 occupants hostage, while several individuals managed to hide from Coulibaly in a refrigerated cellar.Griff Witte, “In a kosher grocery store in Paris, terror takes a deadly toll,” Washington Post, January 9,2015, https://www.washingtonpost.com/world/europe/paris-kosher-market-seized-in-second-hostage-drama-in-nervous-france/2015/01/09/f171b97e-97ff-11e4-8005-1924ede3e54a_story.html?utm_term=.2d7aacfbb438. Coulibaly captured footage of the attack with a GoPro camera, and demanded that one of the hostages upload the videotape online, as Coulibaly was unable to connect to the store’s WiFi. Coulibaly reportedly asked the hostage who uploaded the video, “Do you understand why I am doing what I am doing here? I am here because the Prophet has given me an order. I am here to stop the war in the Arab countries.”Lewis Smith, “Paris supermarket hostage reveals killer Amedy Coulibaly told him: ‘It’s nothing personal’,” Independent (London), July 8, 2015, http://www.independent.co.uk/news/world/europe/paris-supermarket-hostage-reveals-killer-amedy-coulibaly-told-him-its-nothing-personal-10376266.html. John Lichfield, “Paris attackers interview with French TV station: ‘We are defenders of the Prophet… We took vengeance’, said Charlie Hebdo killer Cherif Kouachi,” Independent (London), January 10, 2015, http://www.independent.co.uk/news/world/europe/paris-attackers-gave-interview-to-french-tv-station-we-are-defenders-of-the-prophet-we-took-9969749.html. Ricky Ben-David, “4 dead as French forces storm kosher supermarket,kill gunman; Charlie Hebdo terrorist brothers also killed,” Times of Israel, January 10, 2015, http://www.timesofisrael.com/terror-onslaught-in-paris/. On January 10, a video was distributed online showing Coulibaly in a video that he had filmed prior to the attack. In the video, he claimed to be a soldier of ISIS and to have synchronized the attacks with the Kouachi brothers.Fidelma Cook, Lucy Crossley, Tom Kelly, and Claire Duffin, “Hebdo killers in ISIS martyrdom video – as French police discover his massive arms cache and link him to another shooting two days earlier,” Daily Mail (London), January 11, 2015, http://www.dailymail.co.uk/news/article-2905302/Calm-stare-Jewish-deli-terrorist-Jihadist-s-ISIS-suicide-video-emerges-confirms-link-Charlie-Hebdo-killers-calls-fellow-vigorous-Muslims-defend-prophet-Mohammed.html. In the wake of the Hyper Cacher attack, details emerged regarding Coulibaly’s prior criminal history and radicalization to Islamic extremism. In 2004, Coulibaly was reportedly exposed to radical Islam while imprisoned and living in the cell above al-Qaeda recruiter Djamel Beghal. After his release in 2007, Coulibaly regularly visited Beghal while Beghal was under house arrest in Murat, France, often bringing along funds and guests. Such guests included his spouse Hayat Boumeddiene, as well as the future Charlie Hebdo attackers. According to a later interview with Boumeddiene, she and Coulibaly had partaken in “crossbow practice” at Beghal’s residence.Bill Gardner and Ben Farmer, “Paris shootings: France’s most wanted woman Hayat Boumeddiene has ‘escaped to Syria’,” Telegraph (London), January 10, 2015, http://www.telegraph.co.uk/news/worldnews/europe/france/11337944/Paris-shootings-Frances-most-wanted-woman-Hayat-Boumeddiene-has-escaped-to-Syria.html. Mallory Shelbourne, “New issue of ‘Dabiq’ features interview with widow of Paris gunman,” Long War Journal, February 13, 2015, http://www.longwarjournal.org/archives/2015/02/new-issue-of-dabiq-features-interview-with-widow-of-paris-gunmen-2.php. “Paris attacks: Amedy Coulibaly buried near Paris,” BBC News, January 23, 2015, http://www.bbc.com/news/world-europe-30949917. DolyAngelique Chrisafis, “Charlie Hebdo attackers: born, raised and radicalised in Paris,” Guardian (London), January 12, 2015, https://www.theguardian.com/world/2015/jan/12/-sp-charlie-hebdo-attackers-kids-france-radicalised-paris. 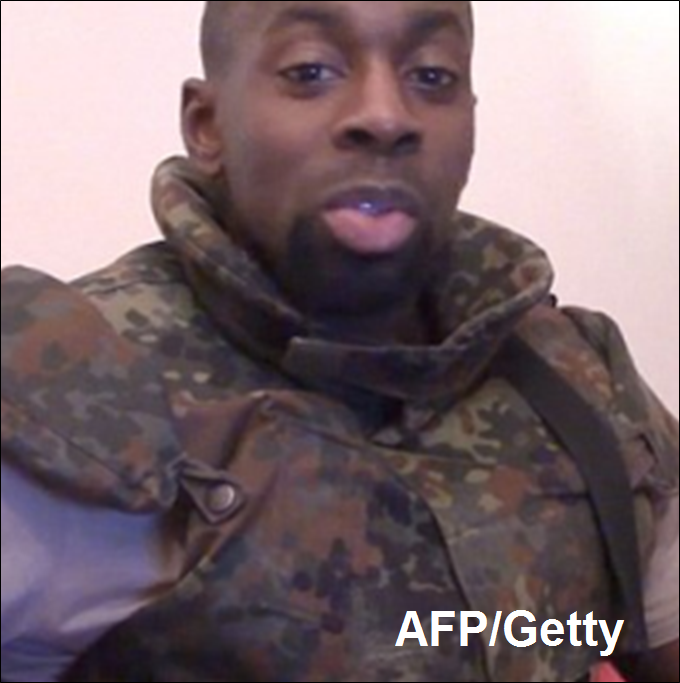 Amedy Coulibaly was the pro-ISIS gunman responsible for carrying out the January 9, 2015, kosher supermarket attack in Paris, killing four people. “Do you understand why I am doing what I am doing here? I am here because the Prophet has given me an order. I am here to stop the war in the Arab countries.”Lewis Smith, “Paris supermarket hostage reveals killer Amedy Coulibaly told him: ‘It’s nothing personal’,” Independent (London), July 8, 2015, http://www.independent.co.uk/news/world/europe/paris-supermarket-hostage-reveals-killer-amedy-coulibaly-told-him-its-nothing-personal-10376266.html. “If you attack the Caliphate and the Islamic State, you will be attacked.”Henry Samuel, “Jihadi video of Amedy Coulibaly emerges from beyond the grave,” Telegraph (London), January 11, 2015, http://www.telegraph.co.uk/news/worldnews/europe/france/11338159/Paris-attacks-video-emerges-of-Amedy-Coulibaly-pledging-allegiance-to-Isil.html. “You [France] and your coalition—you almost above all—bombarded regularly over there, civilians and fighters.”Henry Samuel, “Jihadi video of Amedy Coulibaly emerges from beyond the grave,” Telegraph (London), January 11, 2015, http://www.telegraph.co.uk/news/worldnews/europe/france/11338159/Paris-attacks-video-emerges-of-Amedy-Coulibaly-pledging-allegiance-to-Isil.html.